Data Execution Protection also known as DEP is restrict certain programs from running codes. You can easily turn off DEP for some programs. You can turn off DEP for some or allow programs to execute codes through Windows' system properties.You can call DEP a security feature in new generation Opearating Systems and is included in OS x and iOS other than Windows. Data Execution Prevention is a feature of Windows Xp or later Operating Systems and Apple introduced DEP system into their Opearating system when they planned to move 32bit in 2006. DEP is a background feature and don't have to do configured for a normal users, it requires for some advanced users to configure and manage data execution for some programs. 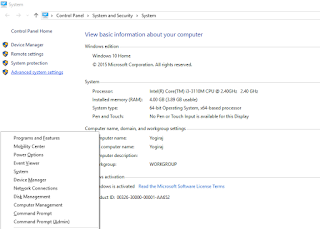 Open System Properties (in Windows 10 Press Win + X and choose system option) and go to Advance System Settings. Now Choose Advance tab and click on Settings and move to "Data Execution Prevention" Tab. * Windows essential Programs and services. * All Programs and services expect those I select. 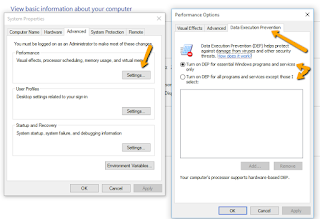 For the first option data execution is allowed to Windows program and services and it's completly safe but in case of second option, you will allow all programs expect the listed programs by you. If you don't have any idea choose first program and restart your computer but if you want to configure it then go ahead and choose programs you want to restrict, save settings and restart. By default this option is turned on for Windows programs and services. If you have any questions or comments regarding turning on/off DEP then let us know below.